Ordinary number signature Leng UNC about 21,000 - 22,500 baht. Ordinary number signature Leng VF about 18,000 - 19,000 baht. The 6th series 20 baht banknotes type 1 is identical to the 4th series 20 baht (Thomas) but printed the guilloche design with only pink ink in order to shorten the process and saved ink. 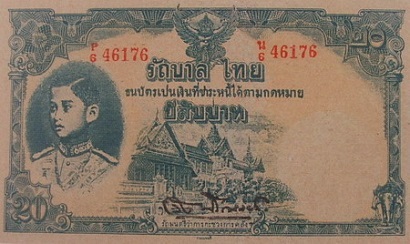 The 6th series 20 Baht type 1 banknotes were announced on 26th March 1945. 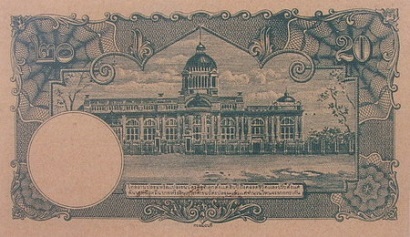 The Minister of Finance later announced on 20th November 1945 to withdraw the 6th series 20 banknotes from 1st December 1946. The main object is the image of King Rama 8 on the left. The middle image is the Dusidapirom Pavilion and Chakri Mahaprasart Throne Hall at the Grand Palace. The serial code and number were printed with red ink.